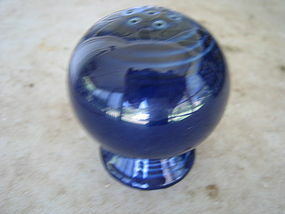 Replacement salt shaker for Homer Laughlin Fiesta Cobablt Blue. There is no damage. Pepper is available and priced individually (both for $14.00). My photo is not picking up the bright cobalt shade. I need your zip code to calculate the postage. Replacement pepper shaker. There is no damage, but has the usual manufacturing flaws. Salt shaker is available and priced individually. I need your zip code to calculate the the postage.